A happy Thursday to you! 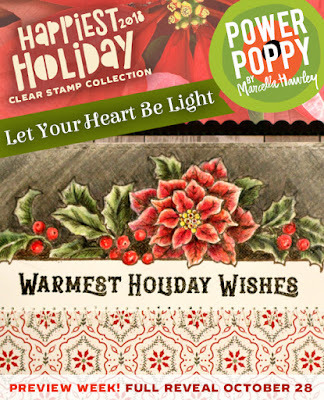 We’re back with more in the Happiest Holidays 2018 release at Power Poppy! 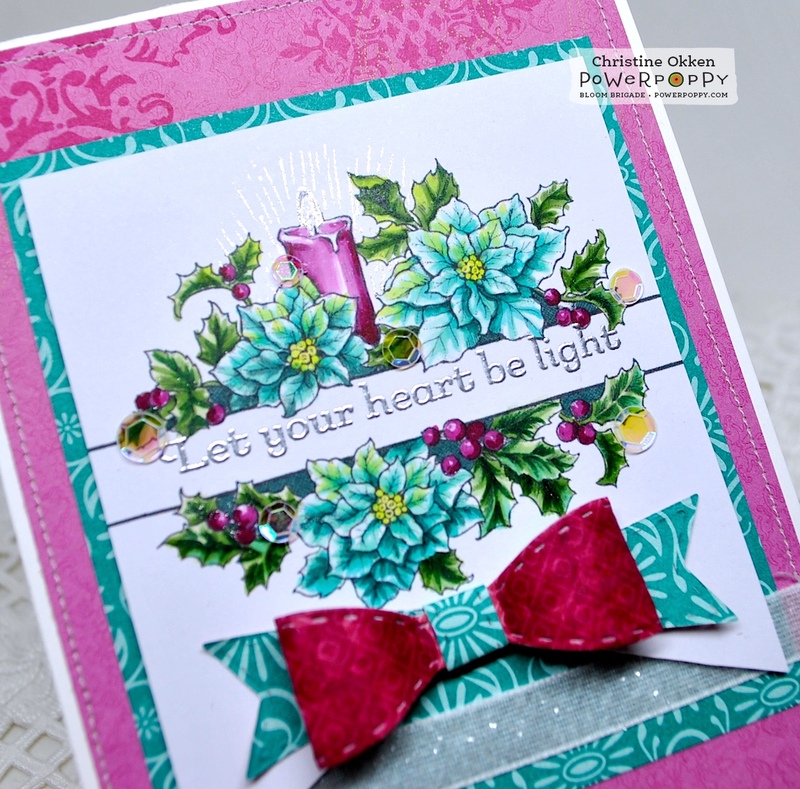 Today’s set is called Let Your Heart Be Light, and its a beauty! I chose to use the double spray of borders to surround this beautiful sentiment in a larger sized card. 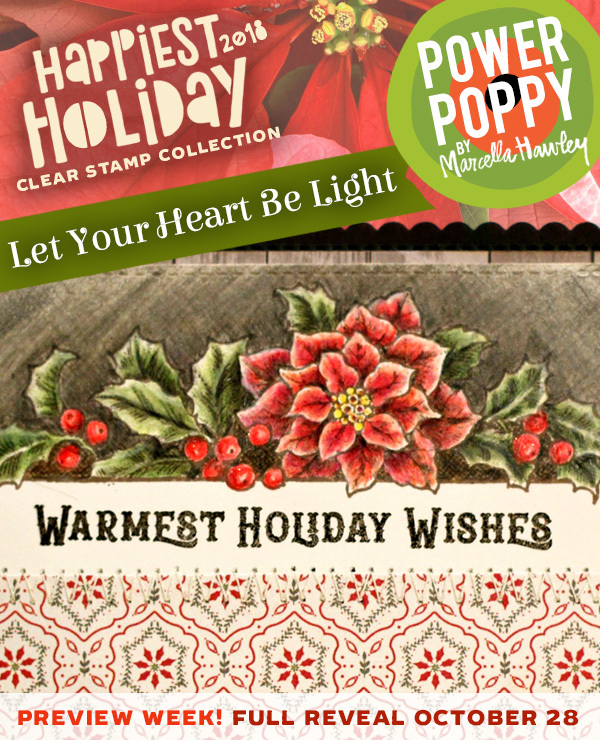 These borders are so beautifully sized to give you lots of floral to work with. I went with some cool shades of deep pink and teal Copic colouring, with touches of shimmer and glitter to accent. Just like the pretty shimmery glow of a candle. The sparkle comes with a glitter pen over top of the candle flame, and then some shimmery white ribbon to go with the pretty paper bow (TCP die). Some of the iridescent sequins took on a yellow glow in the picture but they change colours depending on the way you turn the card. I added to the candle “glow” by giving the leaves and poinsettias a bit of yellowy-green. It’s just a beautiful set friends. Looking for more beautiful candlelit inspiration? See you back here tomorrow with something cozy! I just LOVE the colors you used. Fantastic coloring! Just beautiful, Christine! Marcy's description is interesting and now I can't wait to see the whole set. Stellar coloring and such lovely color choices! 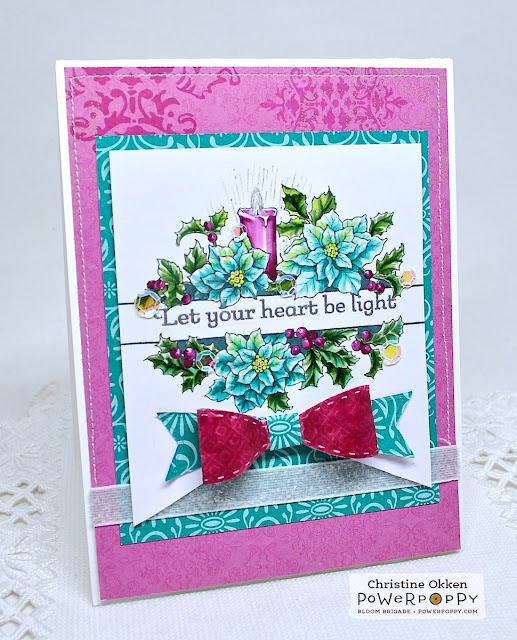 Beautiful card...Fabulous coloring...Love the way you bordered the sentiment. Soooo pretty Ms. Christine and I bet with all the shimmer it is even more beautiful in real life! You have such a way with color and bringing all the elements together with perfection! Beautiful! I love the colors and the bow is a perfect accent! Great card! Loving the new images! Your colors are amazing, love your card! Beautiful, love the sentiment through the flowers, lovely coloring! I love your card. The sparkle is just the right touch and I love the glow of it all. I must know, where can I get the die for that bow? Love love love the colors you choose, and the bow tie is just darling. Beautifully done.